A white, bright smile helps dental patients feel confident. 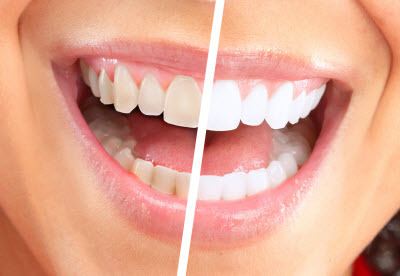 Staining is common and can hamper self-esteem, but professional teeth bleaching is a safe and effective cosmetic treatment that restores the appearance of a healthy and beautiful smile. Contact our office today and you can achieve a new smile in as little as one appointment! Gentle Same-Day Teeth Whitening with Zoom! For patients interested in obtaining a whiter smile in less time, Dr. El Bjeirami and his team offer fast results with Zoom! in-office whitening. While some patients are hesitant to have their teeth whitened due to concerns about discomfort or sensitivity, our new Zoom! bleaching system is gentle on teeth and gums. We apply Zoom! whitening gel to successfully remove stains from the surface of teeth. In about an hour, you can leave your appointment with a radiant new smile. In-office whitening from our team is perfect for weddings, important job interviews, presentations, and other events where you want to look your best. It’s important to note that whitening will only create the desired effect on natural teeth. If you have a combination of natural teeth and those restored with veneers, crowns, or bridges, ask our cosmetic dentist about how we can improve the appearance of your smile with more comprehensive care. While many of our patients prefer the speed of same-day teeth whitening, there are others who like to take treatment at their pace and from the comfort of their homes. In these cases, we offer professional take-home whitening strips from SheerWhite, which is also a Zoom! product. You can expect the same beautiful whitening results, but with convenient strips that provide more predictable whitening than over the counter products. This at-home treatment is comfortable; patients don’t have to deal with bulky oral trays and messy dental impressions. These easy to use strips create the desired effect in only five days, compared to several weeks with drugstore kits. Ask our Cosmetic Dentist about Teeth Whitening Specials! North Family Smiles makes it easy to achieve the white and bright smile you’ve always wanted. If you’re new to our office, your first exam – including teeth cleaning and X-rays – includes a free at-home whitening kit. Or you can take $75 off your treatment, including whitening, if you are a new patient. To learn more about teeth whitening in San Antonio, contact our dentist and the team today!